Being a mover is kind of like being a professional referee. When you do your job well, you get next to no appreciation. Mess up once though and expect to hear 40,000 fans screaming at you that you’re the scum of the earth (okay, maybe professional refs get a little more scrutiny). All kidding aside, when your job involves transporting the most precious possessions someone owns, there’s a lot of pressure. Movers work really hard to make you happy. And when they’re done, you should strongly consider rewarding them for their exemplary service. Even still, we understand that the etiquette for tipping can be confusing, and you might want some advice on when and what to tip. So, without further ado, here’s a comprehensive guide to tipping your movers. Tipping should always be based on the quality of the service you receive. If you don’t feel satisfied with the service that your moving crew has provided, like if they dropped your great aunt Ethel’s prized antique rocking horse that has been passed down through generations, then you shouldn’t feel obligated to tip. That being said, you should always remember that the people you are tipping are the people actually doing the physical labor, not the people who work at the office of the company. So, if booking and coordinating the move was a nightmare, you shouldn’t hold it against the moving crew. This is the part that can get a little uncomfortable. No one wants to overtip, but no one wants to be a cheapskate either. The suggested tip amount that you’re going to find on the internet can vary a little. We recommend tipping 10–15% of the total cost of your move, split among each of the movers. This averages about 5% per mover. Use your discretion to determine the amount you tip. If the movers were fine but did nothing out of the ordinary, tip them 5-10%. If they went above and beyond, maybe you asked them to move your couch around the living room a few times to see where it looks best or they even helped you find your dog when you clumsily let him out of the house, tip them closer to 15–20%. Truthfully, your movers are going to be happy regardless of how much you tip, but it’s nice to reward them for the amount of work they do. 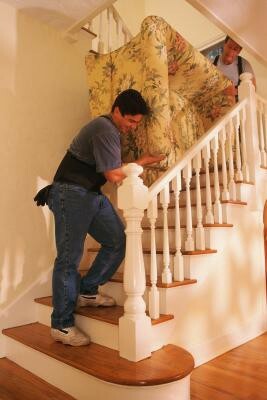 Always consider the size of the move, how many stairs you have, if they lifted some extra heavy furniture, and how much time they spent at your house. Just be honest with how much you think they deserve. Bonus: Treat your movers well. At the very least, offer the crew some cold water or soft drinks to keep them hydrated while they work. Some people like to buy the workers lunch. We’d recommend you always ask the movers what kind of food they’d prefer. They probably get offered pizza for lunch more often than you think, and as great as pizza is, it can definitely get old fast. It’s nice to give each mover their tip individually. We’d like to believe that if the entire tip is given to the head mover it will reach them all hassle free, but you never know. They will certainly appreciate being given their tip by you in person. Cash is always best. They can spend right away and however they want.